The Heinrich Böll Foundation, the Green European Foundation, the Federation of Young European Greens, the Cooperation and Development Network and the Czech Young Greens cordially invite you to apply for the 6th Congress of Young Europeans, which this time is going to take place in Prague, Czech Republic. At the four-day Congress, selected participants from all over Europe will have a chance to come together in this beautiful and especially historically important Central European capital to discuss their visions of Europe’s future. 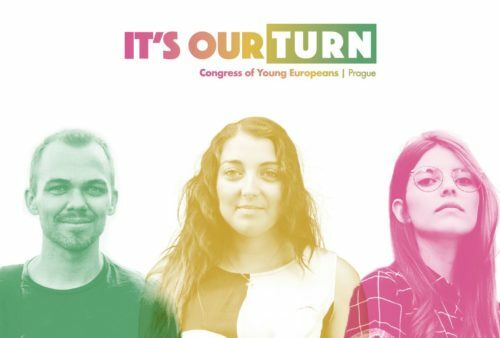 The Congress, entitled “It’s Our Turn!”, will focus on the role of youth in shaping Europe. As a participant, you will reflect on the protest movements from 1968 and 1989 and debate issues that concern you today as well as ways in which you can mobilise to shape the future for the better. You will take part in hands-on workshops on topics such as media in activism and the role of youth in urban development and get the chance to propose and even facilitate your own session! The Congress will take place between 30 August and 2 September 2018. The working language of the congress will be English. This entry was posted in News and tagged cdn, CDNEE, Congress of Young Europeans, Cooperation and Development Network, Cooperation and Development Network Eastern Europe, Czech Republic, Czech Young Greens, eastern europe, Europe, Federation of Young European Greens, FYEG, GEF, Green European Foundation, Heinrich Boell, Prague. Bookmark the permalink.